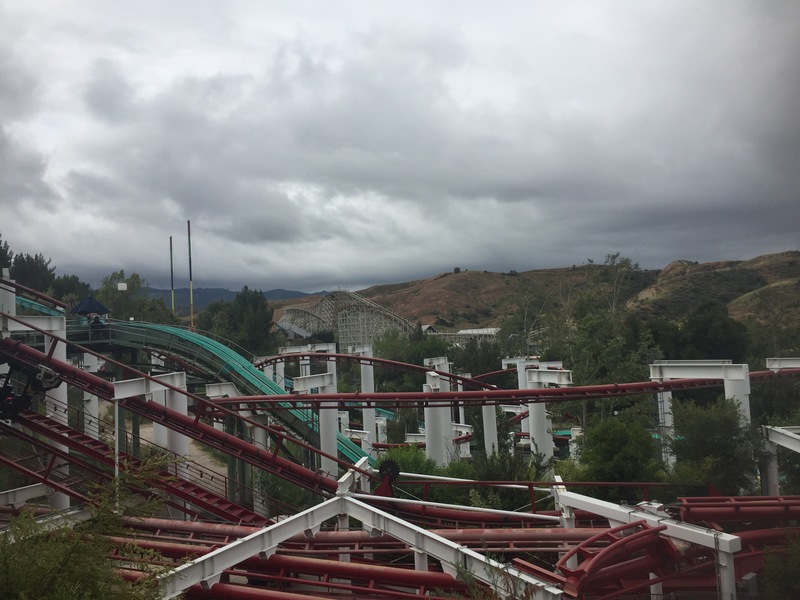 On Tuesday, April 18th, I took first ever trip to Six Flags Magic Mountain in Valencia, California. The park is home to a whopping 19 roller coasters, and I planned on getting on as many as possible. Coming along with me for the trip was my brother, Brandon, and my dad. The view from the parking lot was both intimidating and exciting! We arrived at the park at 10:15, and booked it to the gates. It was an off day at the park, but there was still a decent crowd forming at the entrance. Luckily, we used our Gold Passes to skip these crowds and get into the park early. 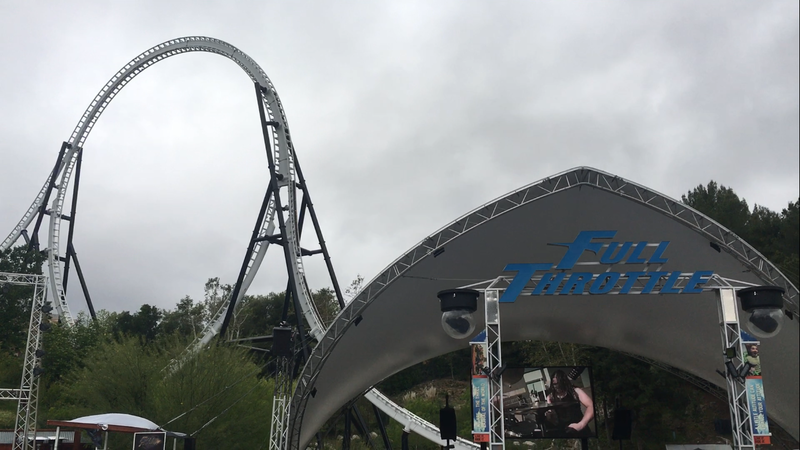 Once inside, we rushed over to our first ride of the day: Full Throttle. It was a great way to “launch into the 2017 season” (not sorry about that terrible pun). After that we made our way to the Screampunk District for Twisted Colossus and Scream. 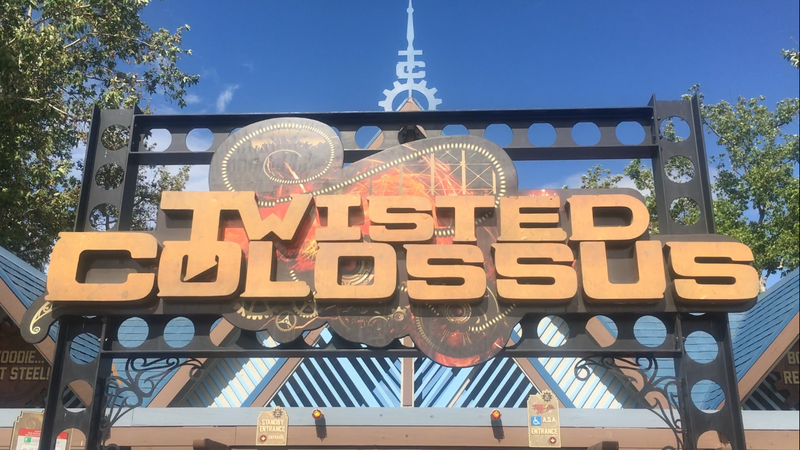 Both rides were a walk on, so we decided to head for Twisted Colossus. It ended up being everyone’s favorite coaster of the day. Such a great ride! Unfortunately, I can’t say the same about Scream. We had an entire train to ourselves, which was cool, but the fun ended there. 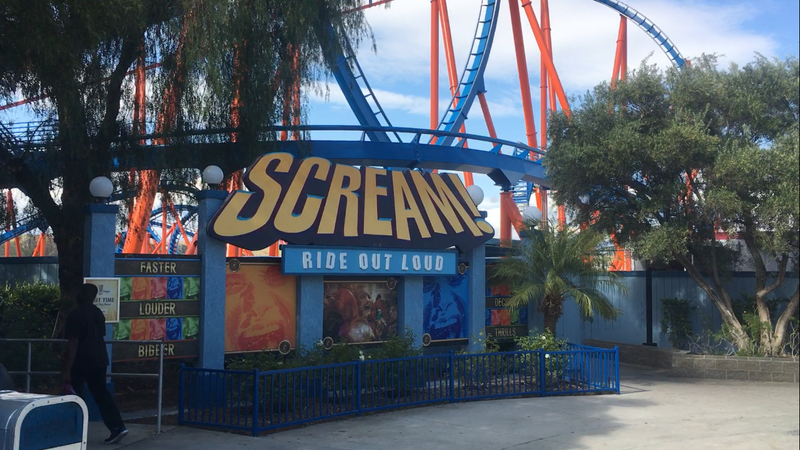 I’ll talk more about Scream in a separate review, but let’s just say it was the worst, roughest coaster of the day. I didn’t really get any good pictures of Scream. I guess that’s cause I wanted to get as far away from it as possible. Then we wanted to ride Riddler’s Revenge and Apocalypse. 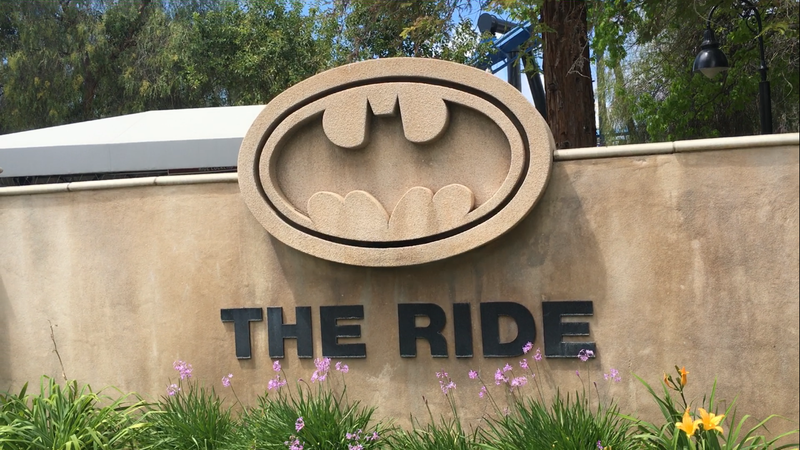 Unfortunately, we found out those two rides were temporarily closed for the construction of Justice League. That meant two less credits for us. 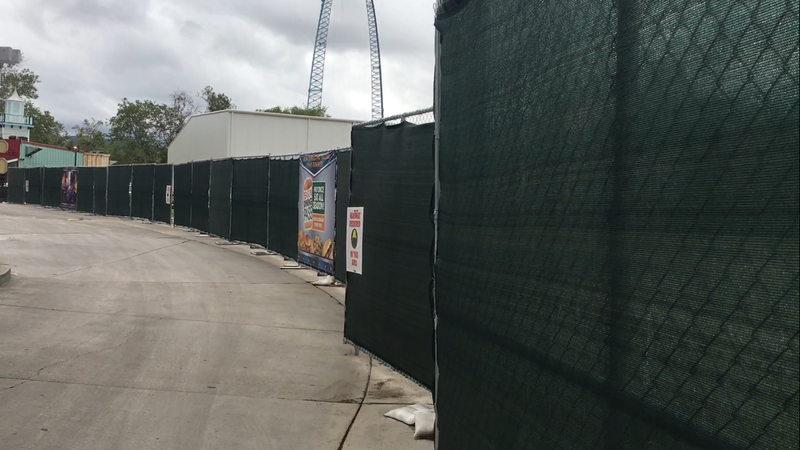 Black fence by Justice League construction stretched as far as the eye could see! We then found ourselves hiking up Samurai Summit to go ride Ninja. It was actually very fun and intense for a family coaster, and ended up being one of my favorite coasters at the park! 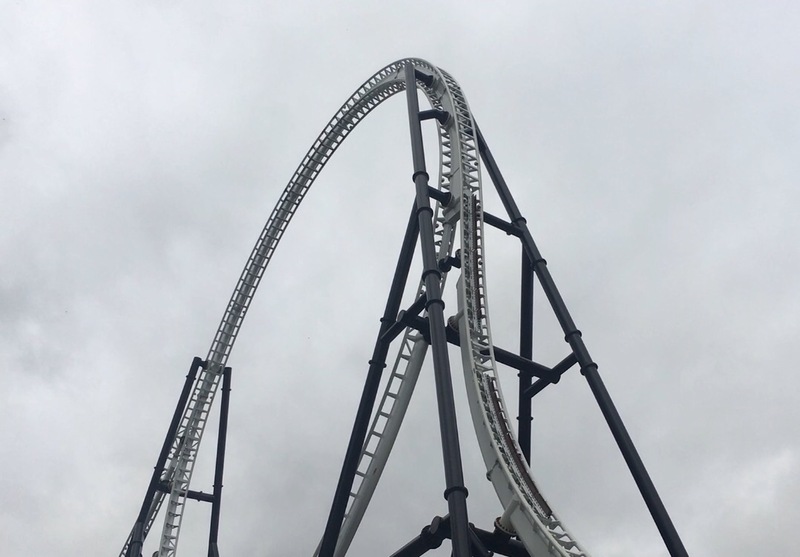 Dark clouds forming over Ninja. We did have to deal with some mist/rain in the morning. I was the only one in the group that wanted to ride Superman, so we decided to save it for later. Instead we went down to Tatsu, X2, and Viper. They were all decent rides, but X2 and Viper were a bit too rough to be considered great. Also, Tatsu’s pretzel loop is unbearably intense, and really takes away from the otherwise fun experience. We circled back around to the entrance, and headed for Goliath. This was probably the biggest surprise for the trip. I expected Goliath to be a terribly paced, boring ride. Instead it ended up being my 3rd favorite at the park! The section after the midcourse is incredibly intense, and really makes up for the average first half of the ride. 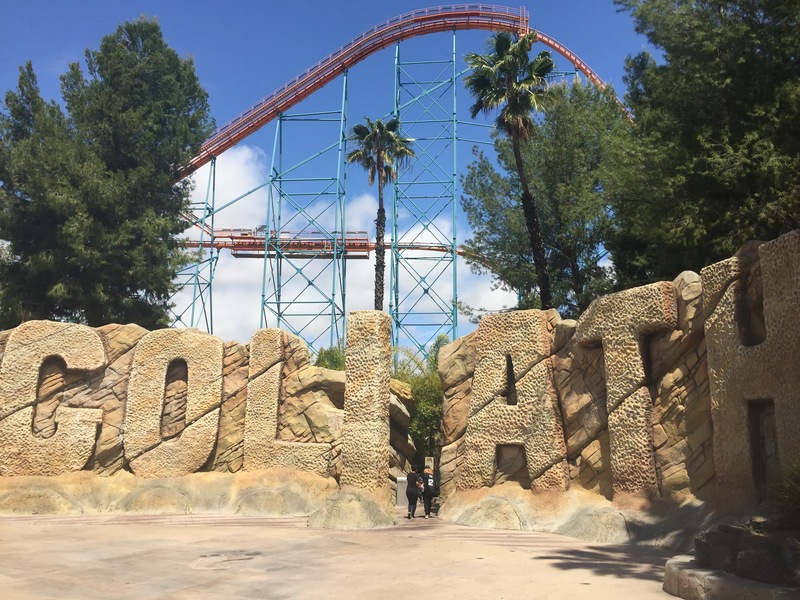 Goliath was a surprisingly remarkable ride! Also my new favorite ride sign! We then walked into the DC Superheroes area to ride Batman and Green Lantern. I actually found Magic Mountain’s Batman to be more intense than Great America’s. The color scheme was also nicer in my opinion. This was the point where Brandon and I started making endless references to the Coaster Studios Batman: The Ride parody. As for Green Lantern, it was…eh. I don’t have much to say about it other than the track looked cool, it wasn’t quite as rough as people say, and it’s operations sucked. Wait times were excellent throughout the day, with the exception of Green Lantern. It wasn’t a terrible wait, but I mean, 20 minutes is worse than 5. We still needed hit up Gold Rusher, but before that we decided to ride Magic Mountains bumper cars. 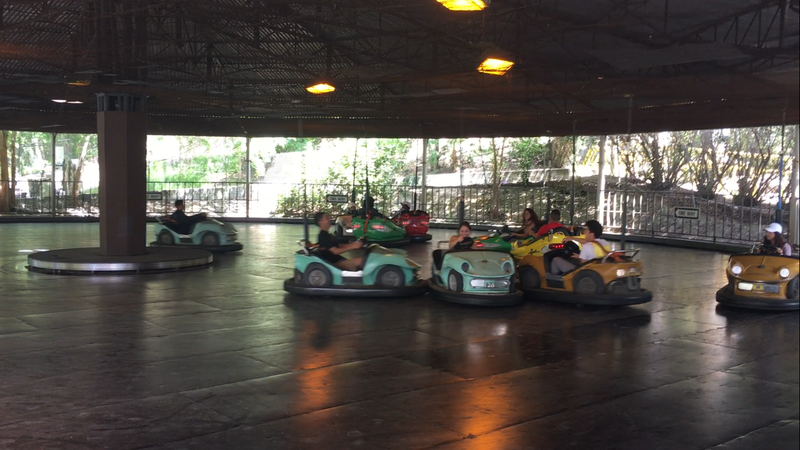 I think they were called Sandblasters, and they were just your standard bumper cars. I’d say Great America’s were more fun. Gold Rusher was a fun mine train ride, but had nothing on Big Thunder Mountain at the Disney Parks. 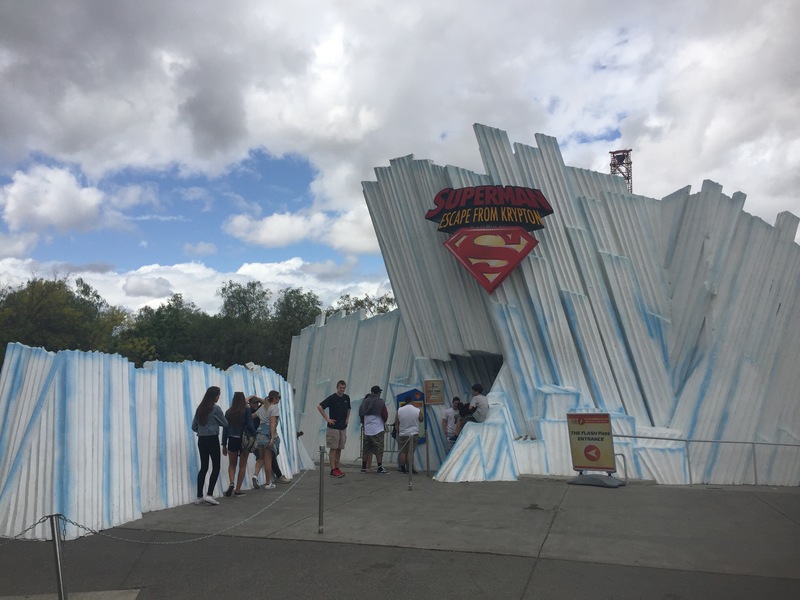 After riding it, the time had come for me to brave Superman: Escape from Krypton. 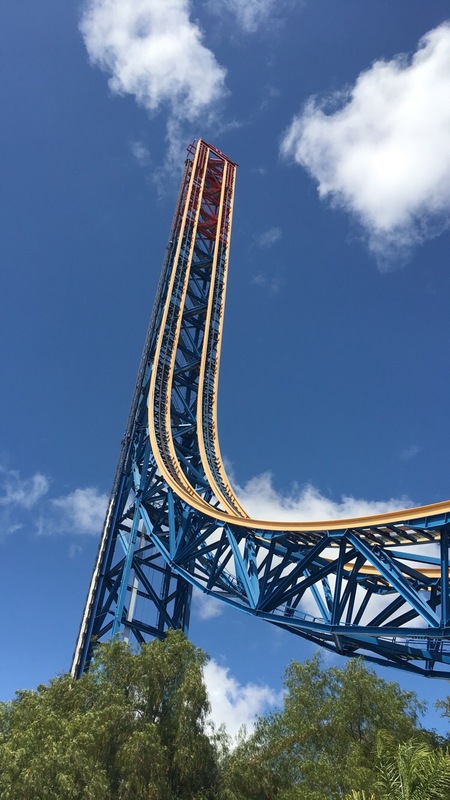 It would be the tallest coaster I had ever ridden, at a height of 415 feet tall. 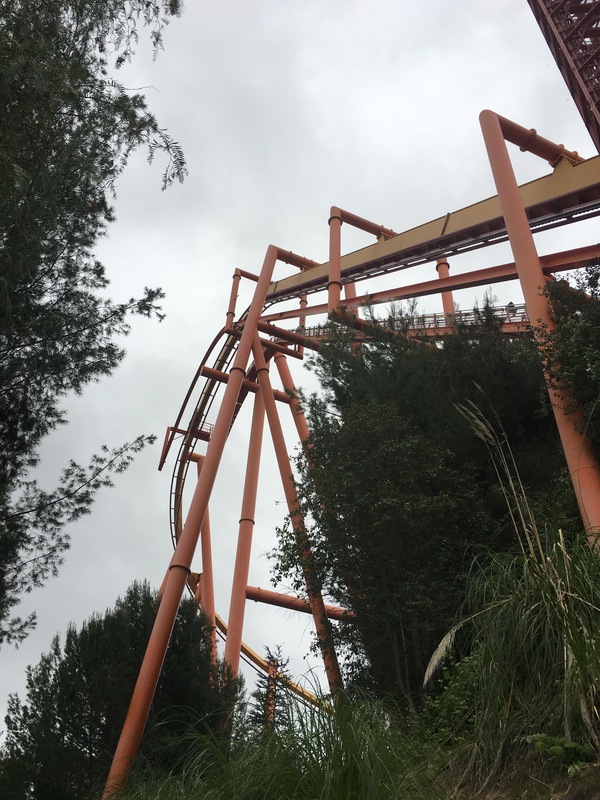 It was a truly excellent ride, and my 2nd favorite at Magic Mountain. It didn’t feel nearly as tall as it was though. That’s probably just because it’s a short experience with a launch instead of a lift. By the time I got off Superman, it was about 3 o’clock. We ate a late lunch at a counter service restaurant called Wascals, which offered your average amusement park food such as chicken tenders and burgers. I’ll release a full review of the food at a later date. After lunch it was time for re-rides. First we did Goliath again, and it was even better the second time. Then we had two more rides on Twisted Colossus, and another ride on Scream (It still sucked). 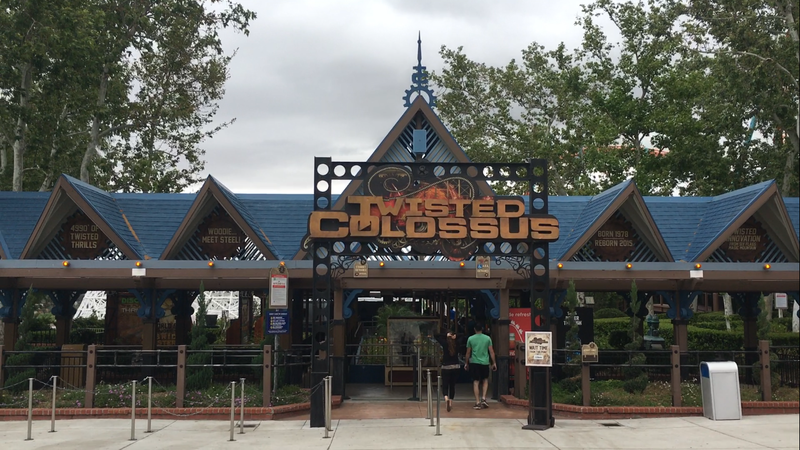 Twisted Colossus is still a station wait? Yes please! We circled the park one last time to grab some extra b-roll footage for our vlogs, and then walked towards New Revolution. Sadly, the ride had an hour wait with the VR, so we decided to skip out on it. We would end up with 12 of the parks 15 credits (not counting the kiddie coasters). Finally, we hopped on Full Throttle for our last ride of the day. Like Goliath, the ride was even better the second time, and was probably my 4th favorite at Magic Mountain. Everyone’s least favorite part of the ride: The drop-brakes! We exited the park around 6:30, for a total of about 8 hours in the park. I picked up a Twisted Colossus mug before we left, to commemorate the excellent ride. Mug #1 of the 2017 season! That was our day at Magic Mountain. I’ll be sure to post tons of other content about the park, including a full review on what I thought of the park as a whole. Stay tuned!